Acting Attorney General Matthew Whitaker reportedly counseled top DOJ officials on how to counter President Donald Trump’s demands for investigations into his political adversaries, while at the same time advising the White House on how it could force the DOJ to investigate those same claims. Whitaker is now in charge of the Russia investigation and the special counsel Robert Mueller, and Friday’s news is just the latest in a series of revelations that throw Whitaker’s independence from the White House into question. In May, Matthew Whitaker, then the chief of staff to former Attorney General Jeff Sessions, was reportedly counseling top DOJ officials on how to counter President Donald Trump’s fervent demands to investigate the baseless claim that the FBI „infiltrated or surveilled“ his 2016 presidential campaign. At the same time, Whitaker was advising the White House on how to force the DOJ to investigate those very same claims. That’s according to a new report from Vox, which said Whitaker presented himself as a sympathetic ear when Sessions and Deputy Attorney General Rod Rosenstein agreed that giving in to Trump’s demands would amount to improperly politicizing the DOJ and the FBI. On the other hand, Vox reported, Whitaker was in talks with the White House about how Trump could best pressure Sessions and Rosenstein to cave. One person close to Whitaker told Vox that he was merely trying to calm the rising tensions between Trump and the nation’s top law-enforcement officials. But two other sources told the outlet that when talking to the president, Whitaker cast himself as a staunch loyalist and promised he would „extract as much as he could from the Justice Department on the president’s behalf.“ Whitaker also had several private phone calls with either Trump or the White House chief of staff John Kelly during this time. This week, Trump ousted Sessions and announced that Whitaker would take over as acting attorney general until Trump nominates and the Senate confirms a permanent replacement. 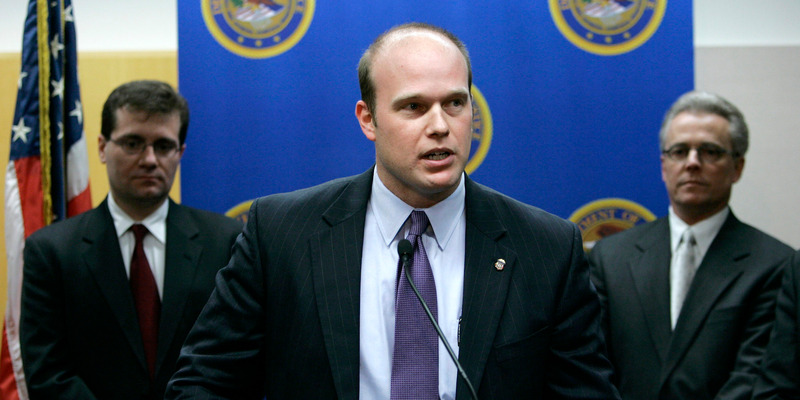 In his new role, Whitaker is now in charge of the Russia investigation and the special counsel Robert Mueller. Vox’s report is just the latest in a series of revelations that throw Whitaker’s independence into question. Speaking to reporters on Friday, Trump said he does not know Whitaker.